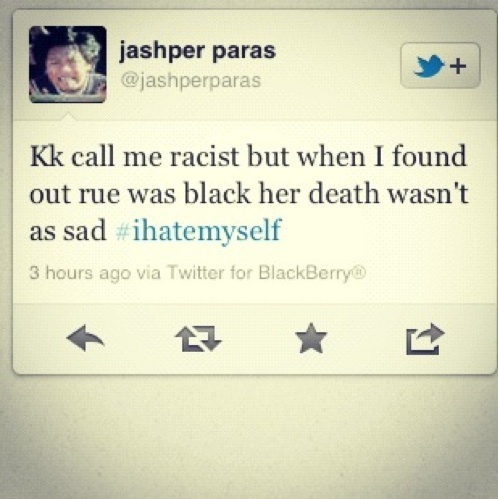 K call me racist but when I found out Rue was Black her death wasn't as sad. I hate myself. I think this commentary is quite interesting and on point, but I want to point out something else that involves troubling race images in relation to the Hunger Games. In my email inbox the other week, I received a note from amazon, welcoming me to explore the world of the hunger games. Although the book has racially diverse characters, it seems that someone in marketing overlooked this fact. All but one of the characters featured in these materials appears to be Caucasian. It looks like all white people. Probably many readers have seen this video of Jessica who is in a good mood and is talking about all the things she likes and how great she is. It is really cute and uplifting. Whoever was filming her captured one of those family moments that make parenthood worth its hardships. This is an emotive piece; I think most people who watch it will feel uplifted by Jessica’s innocent affirmation, just as the person filming her did. Then Maxwell House Coffee took that clip and turned it into a TV commercial with the theme of taking an “optimism break” (video after the jump).